The following article is written by Emily Anson, a licensed archaeologist with Fisher Archaeological Consulting in Hamilton, Ontario. She is the current president of the Hamilton chapter of the Ontario Archaeological Society. I began my academic career as an undergraduate student at Wilfrid Laurier University in the North American Prehistoric Archaeology program in order to pursue my lifelong fascination with North American Indigenous cultures and their material traditions. After taking an anthropology course, I found that this discipline offered something I considered very important: engagement with (and empathy for) the living, vibrant Indigenous groups whose ancestors produced the material culture that archaeologists study. I soon switched my major and graduated in 2008 with an honours BA in Anthropology and a minor in Archaeology. My years exploring different cultural perspectives and Indigenous oral histories in the Anthropology program illuminated the complexities of excavating and studying Indigenous artifacts as a non-Indigenous person. I came to understand the very real need for archaeologists in Canada to engage and communicate with Indigenous communities in a deeper way. At the time, there were few laws and precedents aimed at ensuring Indigenous engagement in archaeological work, while the field of archaeology was dominated by non-Indigenous academics. In addition to acquiring a rich understanding of human social interactions, I learned many useful skills during my anthropology degree that I will carry with me through life such as writing and editing skills and active listening. However, I consider the most important skill I learned to be the ability to empathize with cultures that differ from my own, to understand the world from different perspectives and to have compassion for people who may be very different from me. This allowed me to consider archaeology from a perspective beyond my own personal interests, and inspired me to pursue a masters degree in Anthropology at the University of Toronto. During my master's research, for which I received a scholarship from the Social Sciences and Humanities Research Council of Canada, I explored a facet of archaeology that I consider crucial: the repatriation, or return, of sacred material culture to contemporary Indigenous peoples. Studying repatriation allowed me to combine my love for archaeology with the principles of compassion and empathy I learned from anthropology. I completed my master of arts degree in 2010 with a better understanding of the complex, varied needs of different Indigenous groups with regards to caring for their ancestors' material culture. I learned about different ways of engaging Indigenous groups in the process of archaeological excavation, and how compassionate, open communication can lead to greater understanding of the cultural traditions of the past and can facilitate cooperative efforts in studying, storing and caring for artifacts. I returned to archaeology professionally in 2011, the same year that the Ministry of Tourism, Culture and Sport (the Ontario government body that regulates archaeological work in the province) released a new set of standards and guidelines for archaeologists that placed a much greater emphasis on Indigenous engagement and involvement. 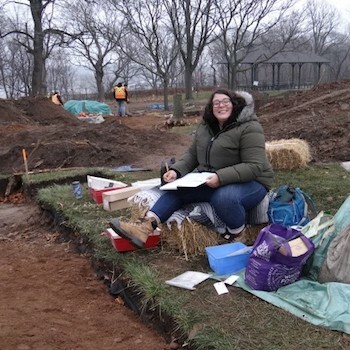 I have worked professionally as an archaeologist ever since and have excavated a wide variety of sites across Ontario including Indigenous campsites, War of 1812 military staging grounds, stone tool quarries, pioneer cemeteries and national historic sites. In 2016, I was elected president of my local (Hamilton) chapter of the Ontario Archaeological Society (OAS) and in 2017, was proud to watch the board of directors of the OAS unanimously adopt the principles of the Truth and Reconciliation Commission, thereby committing to a future of reciprocal ventures, compassion and healing. There is still a huge amount of work to be done. I am hopeful and optimistic that the field of archaeology will continue to be positively influenced by anthropological principles that encourage communication and understanding. Learning and abiding by these principles made me a better archaeologist and I truly believe they have allowed me to succeed and thrive in my field to a greater degree than I ever could have imagined.